The biggest city in Arizona and also the state capital, Phoenix is commonly called the 'Valley of the Sun' and well-known for its rich history and breathtaking desert surroundings. The cultural hub of Arizona, Phoenix has a hot climate and is surrounded by sand and cacti, but is surprisingly popular for all kinds of outdoor activities, including kayaking. If you’re looking to do some kayaking in Phoenix, you might have to be prepared to drive a little out of the city as Phoenix itself doesn’t have a whole lot of water. However, just outside the city limits, several large lakes and reservoirs can be found, offering thrilling kayaking experiences for seasoned pros and relaxing, calm sessions for newbies. Here are some of the best kayaking locations in Phoenix, Arizona. Situated a short drive east of Phoenix on the Salt River, Canyon Lake is one of the prettiest spots to kayak in all of Arizona. Three recreational sites can be found at this lake and they're open all year long. Picnic areas and restrooms are found at each site, as well easy drop-in spots for kayaks. One of the top spots for families and younger kayakers is the Boulder Creek Recreation Site, which has a no boat policy, meaning the only company you'll have out on the water are the birds, fish, and fellow kayakers or swimmers. Big Horn Sheep can be spotted in this area and guided kayak tours run here too. Named for the Saguaro cacti that can be spotted all around, Saguaro Lake is located in the Tonto National Forest and can be found east of the city of Phoenix. With over 22 miles of shoreline and several useful amenities including restrooms and restaurant, this is a perfect place for a day of kayaking and other outdoor activities. Wild horses can sometimes be spotted roaming around the shores and several coves are just waiting to be explored. In the middle of Tonto National Forest sits Bartlett Lake. Covering nearly 3,000 acres of land, this is one of the biggest lakes in the entire Phoenix area, but is still relatively unknown, meaning it stays pretty quiet at most times of year and is a lovely place for couples or groups of friends to simply take to the water for a relaxing paddle while catching some super views of the surrounding desert. 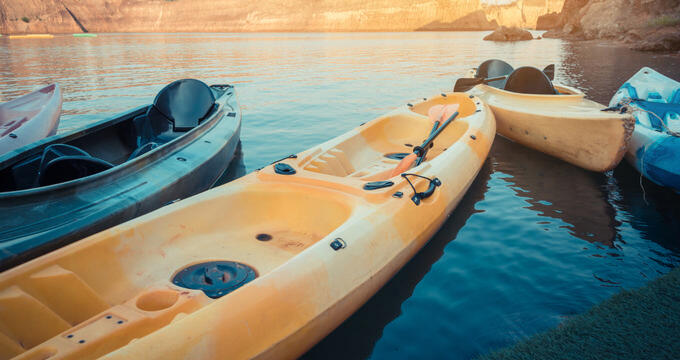 To make the most of your kayaking experience in Phoenix, Arizona, be sure to check out one of the following kayaking companies. Staffed with friendly kayaking experts, these companies offer guided tours, low cost rentals, and other additional services all related to kayaking. Based in Northern Phoenix, Arizona Kayaking offers all kinds of top quality kayak rentals. You can enjoy single, tandem, and fishing kayaks at great prices from this location, and the staff know all about the waters in the Phoenix area, so they'll be able to provide tips and guidance too. Running both half day and full day kayaking trips at Canyon Lake, Bartlett Lake, and Saguaro Lake, Just Roughin' It is the top name to choose if you want a guided kayaking experience at Phoenix. Tours can last from 3 to 6.5 hours in total and can be modified to include hiking too. With many miles of waterways and shorelines just waiting to be explored in the Phoenix area, Go Paddle AZ provides both kayak tours and rentals for all the family to enjoy. Full Moon kayaking tours are especially popular with this company and there's always a great atmosphere and friendly welcome guaranteed. Running kayak and paddleboard sales, rentals, tours, and lessons, Riverbound Sports is one of the top-rated kayak and SUP shops in the Phoenix area. Located right by the beautiful Tempe Town Lake, this kayak company offers great value products and super service.